A big THANK YOU and CONGRATULATIONS to Building for God Community Foundation Board Member, Tom Mooney. 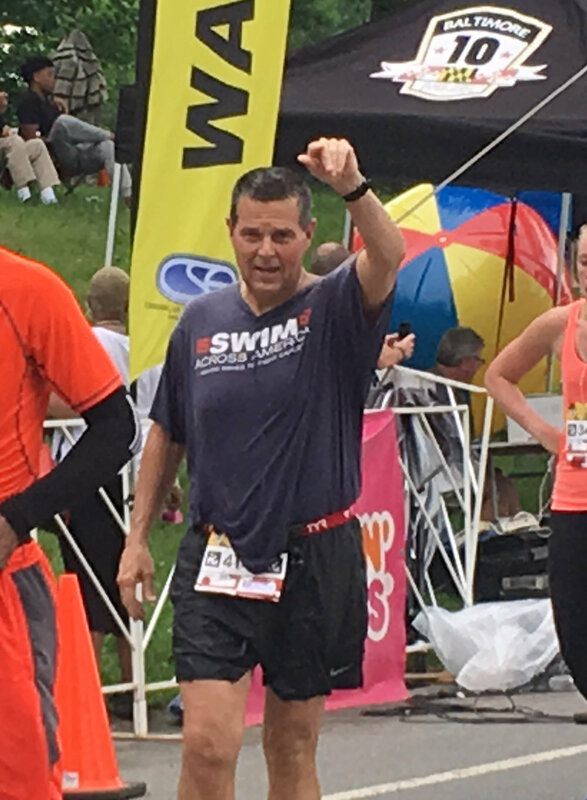 Tom ran on behalf of our Foundation at this year's Baltimore 10 Miler! Supported by WMAR-TV, the funds Tom raised will go to help those in need throughout our community. What a finish! We're so proud. Board members Doug Dalrymple and Tom Shannon are interviewed on WMAR's Midday Maryland show in preparation for The Baltimore 10 Miler. The entire Building for God Community Foundation family was thrilled by the recent Baltimore County Executive Proclamation, issued by Kevin Kamenetz. In it, February 10, 2018 was designated as "Building for God Community Foundation Day" in Baltimore County. This special day also marked our Foundation's 4th Annual Champion in Life Celebration - a day in which so many come together to raise the much-needed dollars that support local charities and non-profits in our community. Thank you to Baltimore County and County Executive, Kevin Kamenetz for recognizing the works of our Foundation and awarding us with this special honor. Katelyn Brooks Buerlein has been named Executive Director of the Building For God Community Foundation (BFGCF). In her role, Katelyn will be responsible for developing and implementing strategies which support the Foundation's mission and 10-year vision plan. In addition, she will oversee all BFGCF programs, events, fundraising and sponsorship activities, volunteer programs, and more. Katelyn will play an instrumental role in leading the growth of the Foundation as we further establish our position within the non-profit sector and expand our reach to those in the community who are in need of our support. When asked to comment on her new position, Katelyn said, "I am thrilled to have the opportunity to impact the lives of others as a member of the Building For God Community Foundation (BFGCF). I recently made the very difficult decision to give up my teaching career to be a stay-at-home mother. It was a decision that was very hard for me to make because I didn't want to lose what made me who I am, which was being a teacher. By joining the BFGCF team, I am able to keep the part of me in tact that is making an impact on others, while devoting more time to raising my son. Family is extremely important to me. The BFGCF is and will be a legacy of my family, and I want to be a part of its success." Please join us in welcoming Katelyn Brooks Buerlein to her new position! WMAR-TV Reporter Mallory Sofastaii will be running in the Baltimore 10-Miler on Saturday, June 3, 3027. Her cause? The Building for God Community Foundation! Mallory will earn money for her charity of choice for each runner she passes. Good luck, Mallory and thank you for your support! The 2017 Champion in Life Gala, benefiting the Building For God (BFG) Community Foundation was help on February 25, 2017. WMAR TV covered the event, which featured Jamie Costello as the evening's emcee. In this news clip which ran the following evening, Jamie shares a bit about the Foundation and those it celebrated in 2017. Our thanks goes to WMAR and Jamie Costello for the great job they did featuring the 2016 Community Cup and the mission of the BFG Community Foundation. We were thrilled to be able to share our 2013 Community Cup event with the local community via a local newscast featured on WMAR's evening news broadcast. The entire Brooks Financial Group Family, which is comprised of our team of dedicated professionals, our private clientele and dear friends, extends its deepest gratitude to all who participated in this year’s Community Cup Invitational. We remain convicted to grow this local cause and through our combined efforts we will continue to bring about an uplifting empowering change in our local communities. Catholic Charities, which in turn provide assistance to St. Vincent’s, St. Jerome’s, Our Daily Bread /Head Start Employment Center. Contribution: $25,000, which will provide 3,333 meals out Our Daily Bread; 208 hours of Play Therapy for children at St. Vincent’s Villa; 2 field trips for 276 St. Jerome’s Head Start Children. The First Tee, in honor of our dear departed friend, Thomas Mathews. This organization provides young people with character-building and life skills lessons using golf as the platform. Contribution: $1,000 annually for the next three years. The balance of the proceeds will be invested and grown in the BFG Community Foundation so that more resources can be shared long term. I’d also like to offer a special recognition to our Executive Director, Kerry Hayward. Without Kerry and the dedicated individuals listed above, this event does not fly, period. Finally, I’d like to encourage you to visit the Community Cup website so that you can review the many aspects of this years’ event, which includes updated pictures of the day. While visiting the site, you can also reserve your spot in the 2013 Community Cup Invitational, which will be held on Monday, October 14, 2013. Finally, please acknowledge those business who have sponsored and if you have business to conduct, seek them out as they are all very best and more importantly do what they do with great care. So from all of us at Brooks Financial Group and The Community Cup, our warm personal thank you and our prayer for God’s continued blessings to each of you and your families. I look forward to seeing all of you at next year’s event, if not before.